Odias serving this sensitive border state of Arunachal Pradesh have always reflected their patriotism as was proved by Utakaliyas during Kaling war in 261 BCE, said DNGC principal Dr N T Rikam today. Addressing Arunachalee-Odias celebrating their 83rd Utakala Diwas in college auditorium here, he said that Odisha is a fabulous state which changed the course of Indian history as Mauryann Emperor Ashoka failed to defeat the brave Utkala warriors during bloody revengeful Kalinga War but turned a peace messenger by adopting Buddhims. This is a louder message for the humanity as Ashoka, who earned the sobriquet of Chandashoka by butchering 100,000 fighters and capturing 150,000 more, had turned Dharamasoka, he reasoned. Buddhisim ultimately established link between Utkal and NEFA (present Arunachal) with his messenger son Mahinda and daughter Sangamitta while preaching Buddhisim had returned home from Burma (Myanmar) through Arunachal. Binding multi-ethnic, multi-cultural and multi-lingual Indians together poses great challenges as regional aspirations give thrust to cessionism, he said and called for standing united to maintain the unity and integrity of this Mother Land, he advocated. The efforts of Arunachal Utkal Sanskrutika Parisahd (AUSP), representing Odias of peaceful state Orisha, in this direction is praiseworthy, he said to the applause of the gathering. The very presence of my teacher (Dr Nishamani Kar of RGU) is proof of the vital role of Odias in education sector, he added. The Odias decided unanimously to continue to serve this fast developing state with new vigour in response to call by AUSP president Chabi Nayak. Odiays working sincerely in education, media, trade, state and central Govts etc. have been contributing to state building, he said, adding this community discharges its duty always with commitment. AUSP treasurer Santosh Das recalled the history of Utakala, formed this day in 1936 as first linguist state in Indian history as pioneered by barrister Madhusudhan Das to be known as Utakala Gauraba. But philosophy of Utkalamani Gopabandhu Das – mishu more deha a desh matirey, desh bashi chali jayantu pithire (Let my body merge with my motherland and by people walk on my back) or Andhakabi Bhima Bhoi – mo jiban pache narke padithau jagat uddahr hau – (Let the humanity survive even my lf mu life is in hale) philosophies have been guiding the Oriyas since time immemorial, added Das, manager of Canara Bank. Pioneer electronic & print journalist Pradeep Kumar recalled that former governor Surendra Nath Dwivedi was instrumental in holding 1st Utkal Diwas in Raj Bhawan here in 1992 that gave birth to AUSP. However, a 100-member team from Odisha had attended Utkal Diwas here next here under inter-state cultural programme, he said. Endorsing Dr Rikam’s concern for national integration, Kumar disclosed that the National Youth Project (NYP) of which he is the vice president is engaged in conducting national integration youth camp to achieve the goal. A camp was conducted in 2015 in DNGC when about 357 youths from 29 states had taken part, he said. Pointing out that media means ‘mein’ ‘diya’ (I gave) encompasses one and all in the society but not the visible print and electronic as commonly believed, Kumar said that media only serves as medium, Kumar said and made a fervent appeal to all to reciprocate to the motherland and the to the society which have made what they are today. 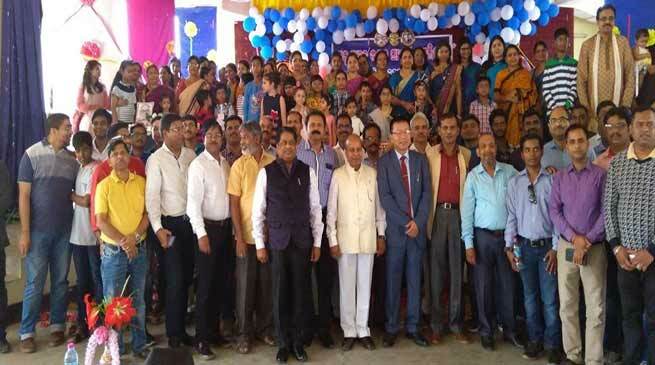 The event was punctuated with cultural and traditional programmes, showcasing the age-old Jagganath tradition for which the state is globally known, but coincided with April fool’s Day. An animated film by DNGC assistant professor(education) Shushanta Kumar Nayak on history of Odisha and classical Odishi dances by Khusi Sharma, Pratima Dash & Nilatpal Sahoo and melodious Odiya numbers by Dr Anuradha Panighrahi (DNGC physics HoD), Namrata Sahu, Sarojini Sahoo and Bijoy Das (intelligence officer) left the gathering dumfounded.